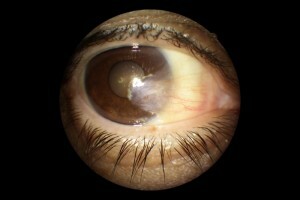 Pterygium is growth over the surface of the eye involving the conjunctiva and the cornea. It's origin is unknown, but there may be a genetic component, since it tends to run in families. Once the pterygium begins to form exposure to sunlight, wind and dust seem to promote inflammation and growth. A condition called "blepharitis", which is an inflammation of the eyelid margin due to bacteria, has being shown to worsen the pterygium. As of today there is no known drop or medicine to make the pterygium disappear. The only effective treatment is surgery. Historically, surgery was reserved for very advanced cases because it had a high recurrence rate - up to 70% in some cases. That means that after the surgery it was very likely that the pterygium would come back. 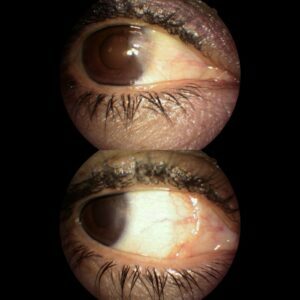 But there have been many advances in the surgical technique and the outlook for patients with pterygium is much better now. Using modern techniques the recurrence rate is now less than 5%, which means it has a 95% (or higher) success rate. That's quiet an improvement! The professional personnel at VCS is highly qualified to make you feel comfortable every step of way towards successful result.